Although Cincinnati did not see any conflict during the War of 1812, it played a pivotal role in almost every Northwestern campaign of the war. At the outbreak of the Second war with the British, Cincinnati had turned into a bustling port town of 2,540 residents. Gone was the military outpost known as Fort Washington. Progress and town expansion had swallowed up its location. Military focus had moved across the Ohio River to Newport, Kentucky. At the mouth of the Licking River, Newport Barracks replaced Cincinnati’s crumbling old wooden stockade in 1803. Being a river town, Cincinnati would be important for the mobilization of troops and supplies going North to support the war effort. Between August, 1812 and September, 1813, no less than four campaigns to Northern Ohio, Indiana, and Michigan began here. As troops and supplies went North, wounded and British prisoners made their way here to convalesce or spend their time in POW camps. 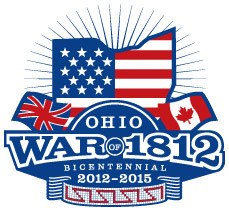 Beginning with this discussion, we will take in depth looks at the impact that Cincinnati had on the War of 1812. Much more will be covered in the Heritage Village Museum War of 1812 Symposium.